This delicious New Orleans-style seafood recipe features pan-seared salmon topped with shrimp in a rich Cajun butter sauce. This weeknight dish, inspired by the fan favorite dish from Red Lobster, will transport you straight to the Big Easy. No one will believe this is a quick and easy recipe, ready to eat in about 30 minutes flat! Who doesn't love to add a new pan meal into the weeknight rotation? Instead of making your own spice mix, feel free to use 1 tablespoon of a store-bought Cajun spice blend. This will cut down on your prep time even more! Per Serving: 420 calories; 27g fat; 3.3g carbohydrates; 39g protein; 306mg cholesterol; 1876mg sodium. The recipe is a healthy spin on my favorite Red Lobster recipe! I had no idea how easy it would be to do this at home and my family went crazy! it was delicious with a side of steamed broccoli. Anything that allows me to add excess amounts of butter is good in my book! This cajun better is no exception- so delicious! I used some bread to dip in the butter sauce cause it's so flavorful. Made this with a side of mashed potatoes for an all around filling meal. OMG this tastes JUST like the Salmon New Orleans from Red Lobster. The Cajun butter sauce is sooo good. Seriously, make this ASAP! 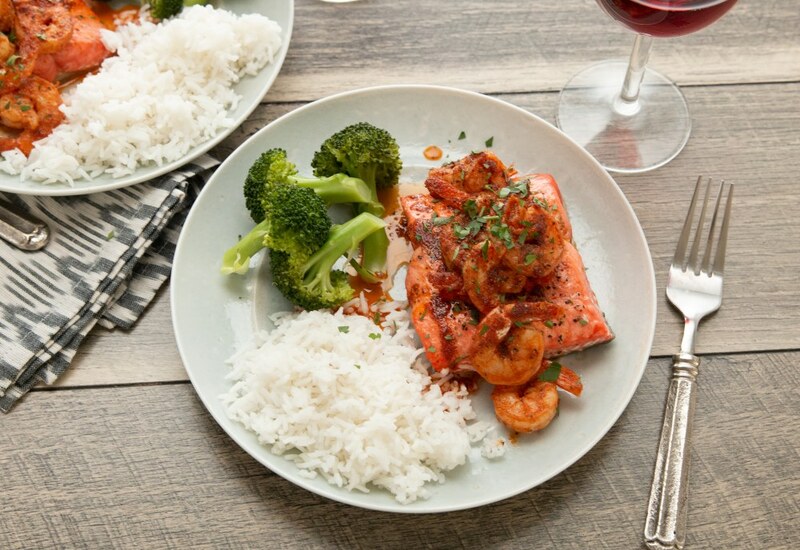 I love the spice blend, it worked really well with the salmon and shrimp. This was really easy to make and goes perfect with rice or a green salad for a lighter meal. This was a really yummy dish! I love all the spices together. I added a little Louisiana hot sauce to the butter, and it made for a delicious, spicy drizzle on top. So quick and easy!